Considering my decision to start watching more pro wrestling each week in 2015, my choice to watch Impact Wrestling got me thinking about a top ten list to make. I wanted to make one consisting of my favorite performers to watch in TNA. This is not a list of the ten best wrestlers in the company or the most decorated people; just the performers that I look forward to seeing when I turn on Impact Wrestling. This list was a lot harder to compile than it would have been back when I was a huge TNA fan and had AJ Styles, Christian and Alex Shelley. 10) Magnus: Back when I was a big TNA fan, one of my favorite acts was the British Invasion. While Douglas Williams was my favorite member of the group, Magnus struck me as a guy with loads of potential. Fast forward a few years and he was chosen to be the heel champion for Dixie Carter within the last year or so. I'm just getting back into TNA full time and he hasn't been part of the Destination America stuff yet but I can't wait to see him return. Something about him screams star and I hope he continues to be a major player when he comes back. Magnus is definitely cool and is a rare, mostly, homegrown talent for the company. 9) Low Ki: Since his indy days, I've enjoyed Low Ki's work. I remember reading when he was the first ROH Champion and he was one of the first people I ever saw in TNA. He would leave and return as Senshi, which led to a great run in 2006 and he was part of the PCS, which I loved. He returned sometime recently, though I'm not sure when exactly and has become a fixture in the X-Division that he helped build. As TNA debuted on Destination America, Low Ki was the reigning X Division Champion and had a cool little video package dedicated to him. While he dropped the belt then, he turned heel and joined the Beat Down Clan in the main event. After winning back the X Division Title on the last show, it's clear that Low Ki is going to be a focal point of TNA and I'm totally ready for that. 8) The Hardys: Growing up, I wasn't as big of a Hardy Boy fan as a lot of my friends. I was more of an Edge and Christian guy. I started to like Matt during his V1 run and then after the Edge/Lita scandal. It wasn't until around 2008 though that I joined the Jeff Hardy bandwagon. Granted, a lot has happened since that time to both men. Some bad and some good. One of the coolest things that I read while I wasn't watching TNA was that there was a rivalry between the Wolves, Team 3D and the Hardys. The past and the future met in huge matches and TNA's Tag Team Titles got to main event, which is something I want them to focus on. It's enjoyable to see the Hardys wrestle because I get that warm nostalgia like feeling and they can still go. 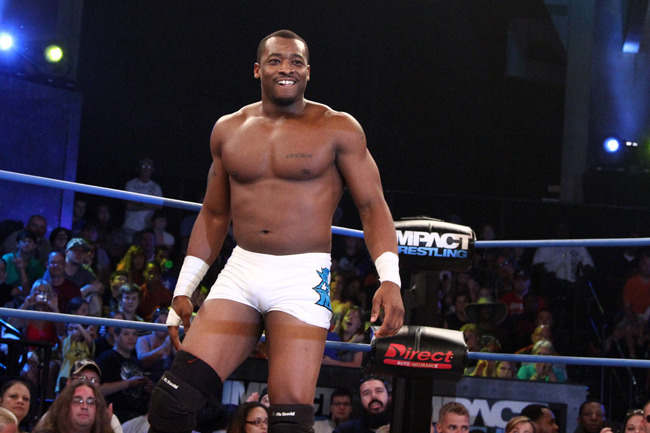 7) Kenny King: During my last few years watching ROH, I became a Kenny King fan. He reminds me of a much more charismatic Shelton Benjamin. When I saw that he came to TNA, I was excited because I felt like he could be a big player in the X-Division, especially if they made it a focal point again. King would go on to win the X-Division Championship but since then, he seems to be relegated to side act. At least in the first two Destination America episodes of Impact, King has just stood by MVP with a group of girls. He's the only member of the Beat Down Clan to not wrestle on Impact Wrestling since the move and I really hope that changes soon. King is a talented guy but I'd like to see him as the X-Division guy in the BDC, while Samoa Joe and Low Ki enter the tag team division. Whatever happens, we need more Kenny King. 6) Madison Rayne: There is a trend with this list if you haven't caught on. A lot of the people that I like watching in TNA, are people that I've found before they joined the company. Madison Rayne is a bit different though. Yes, I first saw her as Ashley Lane in SHIMMER, but I wasn't a fan then. I preferred her teammate Nevaeh. But, she joined TNA, changed her name to Madison Rayne and became a member of the Beautiful People and things changed. Madison fit right in with Angelina Love and Velvet Sky and was a much better worker than Lacey Von Erich, who she replaced. She was so good in fact, that she went on to win the TNA Knockouts Championship multiple times. She moves onto the "Queen" character and nailed that perfectly. The only thing she's ever done that I can remember disliking was her weird Earl Hebner storyline. Currently, she's not the focus of the Knockouts, as Taryn Terrell is the Champion, but I look forward to her moving back up towards the top. I would like to give a shoutout to an honorable mention on this list and that's the Beautiful People and the BroMans. 5) The Wolves: Here's yet another team that I found during their time in Ring of Honor. They were known as the American Wolves and earned my respect when I saw them compete in a Ladder War live. Eddie Edwards wrestled with a broken arm that night. That's tough. After they had a one off appearance in NXT, I was disappointed they didn't sign there. However, since their arrival in TNA, I think they've been handled well. Competing in main events against legendary tag teams like the Hardys and Team 3D is a big deal and their match against the Hardys on the most recent edition of Impact is probably the best one on Destination America so far. I fully expect them to wear the Tag Team Titles in 2015 again because they are that good and, if they ever split, both guys can go in singles action. 4) Awesome Kong: This whole "I found this person before TNA" thing is getting ridiculous. I found Amazing Kong back in SHIMMER, where she was an unstoppable force who seemingly could not have a bad match. She signed with TNA in 2007 and debuted as Awesome Kong where she had a phenomenal run. She would go on to main event Impact with Gail Kim and it didn't seem out of place at all. Kong's TNA run would end bitterly but it was a sight to see for sure. She went on to the WWE as Kharma but that was cut short by her pregnancy. She disappeared for the most part until the Destination America premiere where she returned. That was easily my favorite thing about the premiere. Kong had a face off with Havok and it seems like TNA is building towards a massive showdown between the two women. Kong is a treat to see week in and week out. 3) Ethan Carter III: Well, here we have a variation on today's theme. Yes, I first saw Ethan Carter III as Derrick Bateman in the WWE. However, he did not stand out to me there and seemed destined for the midcard. After getting released, he signed on with TNA and they managed to do something I had never seen them do before. They took a guy who wasn't established in WWE and turned him into something that was awesome. He was re-branded as Dixie Carter's nephew and instantly grew into this amazing character. Even with me not watching TNA on a weekly basis, one of the things I would catch on YouTube were videos of his work. I became enthralled because he turned the EC3 character into must see television. Toss in the addition of Tyrus, the former Brodus Clay, and now he has a bodyguard type character. A less talented Diesel to his Shawn Michaels. On the first two Destination Impacts, EC3 has yet to wrestle, but he's been a big part of the show. His shaving of Jeremy Borash was a great heel moment and then taking over the production truck was fun. I'm not particularly looking forward to EC3/Jeremy Borash, but EC3 is one of the guys in TNA who could make this work and have it be entertaining. I feel that by the end of the 2015, Ethan Carter needs to be wearing the TNA World Championship. I know that the Beat Down Clan, Lashley, Eric Young and Bobby Roode seem to be the mainstays of the World Title picture, but EC3 is that good and needs to put himself in there. 2) Bobby Roode: Bobby Roode is TNA. Understand that. A few years ago, I would have said that AJ Styles was TNA and would have been right, but after he left to NJPW the one mainstay is Bobby Roode. I know that Abyss and James Storm have also been around since day one, but Roode bleeds TNA. He's been part of Team Canada, Beer Money and Fortune. He's won the Tag Titles a few times and is a two time TNA World Heavyweight Champion. In fact, Bobby entered the Destination America era as the World Champion, only to be screwed by the Beat Down Clan. Bobby Roode is the one guy that I can point to and say "That's TNA's guy". They built him from the ground up, with plenty of bumps in the road, but he's it. People saw him as a star for a long time and he's a big part of their past, present and future. Bobby Roode is fantastic. 1) Austin Aries: Since the first day that I saw Austin Aries back in 2004, I was hooked. He was the man to end Samoa Joe's historic ROH World Title run and he made sporadic appearances in TNA. His run in TNA as Austin Starr showed that he has personality and he was part of the classic PCS. After leaving for a while, he went back to ROH, had a ton of classics and developed a new character as the "Greatest Man That Ever Lived." It led him to a second ROH World Title and he would eventually bring the gimmick to TNA. After winning the X-Division Title, he traded it in for a shot at Bobby Roode's World Title. In one of the greatest moments in TNA history, Aries shocked the world by winning the World Title and ending Roode's record long run. Aries has since become a Triple Crown winner and should still be a World Title contender, but he seems to be in the X-Division for now. Regardless of where Austin Aries is positioned on the card, he's a blast to watch and my favorite part of TNA.